The new millimeter wave ADA-2052 active doubler will frequency extend your <26 GHz synthesizer up to 52 GHz with high output power and high harmonic suppressions. +20 dBm output power is provided over 30 to 52 GHz, and at least +16 dBm from 20 to 30 GHz, with an input from -6 to +2 dBm. The ADA-2052 is a RoHS connectorized module ideal for lab use, test and measurement, and prototype systems. Short on real estate but need to knock down spurs or wideband noise? Marki Microwaves latest GaAs MMIC filters are an excellent space-saving alternative to ceramic or cavity filters. 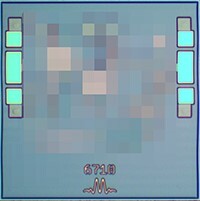 7 new bandpass filters are being introduced as bare die ranging from a centre frequency of 11 GHz up to an Fc of 34.75 GHz. Bandwidths range from 2 to 10 GHz with excellent passband return loss. These are available today. Surface mount or connectorized solutions will be considered for volume applications.